“Forget the power of technology and science, for so much has been forgotten, never to be re-learned. Forget the promise of progress and understanding, for in the grim dark future there is only war. There is no peace amongst the stars, only an eternity of carnage and slaughter, and the laughter of thirsting gods“. The above paragraph summarizes the Warhammer 40,000 universe quite perfectly, evidencing what makes it so unique, and probably one of the best and deepest science fiction settings ever written. You can forget those clean, white starships carrying lazy officers wearing cheesy uniforms, all those peaceful aliens and the guns set to stun. 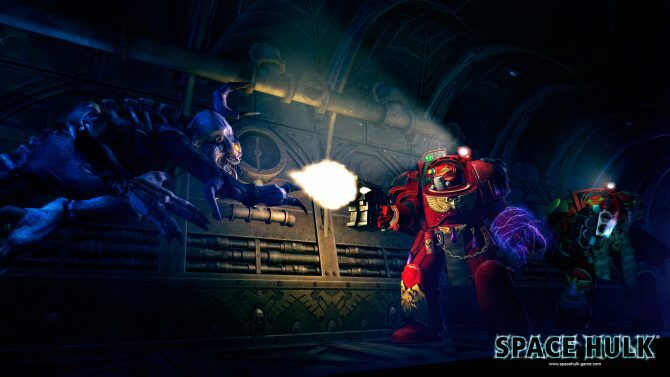 In Warhammer 40,000 deep space isn’t your friendly neighborhood preschool, but a deadly, scary place, full of terrible enemies armed to the teeth that would love nothing more than swallow mankind whole. Not that mankind itself is a pushover. When you’re in a hostile environment you tend to grow fangs, and the Imperium of Man has grown fangs of steel. It has no qualms about sending millions of Imperial Guard soldiers to die a horrible death on remote planets, or to genetically engineer the best warriors to the point that they’re no more fully human in order to bolster the line of defense. 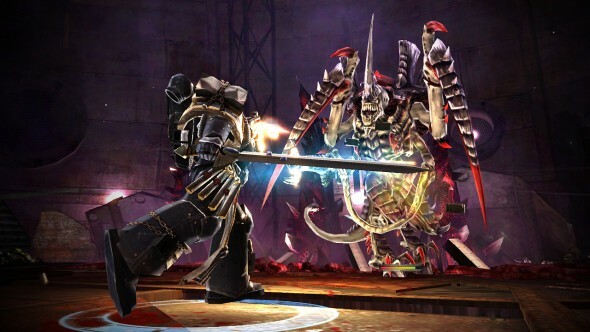 Those best warriors, the mighty Space Marines, are the focus of Warhammer 40,000: Kill Team. A space cruiser (or better, a Kroozer) belonging to the Orks, a savage spacefaring race that lives only to wage war, is approaching an Imperial forge world, ready to unleash a fearsome invasion force. The Space Marines aren’t going to stand idly as that happens, and send one (or two, depending on the number of players) of their mightiest warriors to stop the threat. Kill Team is a twin stick shooter, resembling some arcade titles of old, it lets the player control his character’s movement with the left analog stick and fire with the right one. 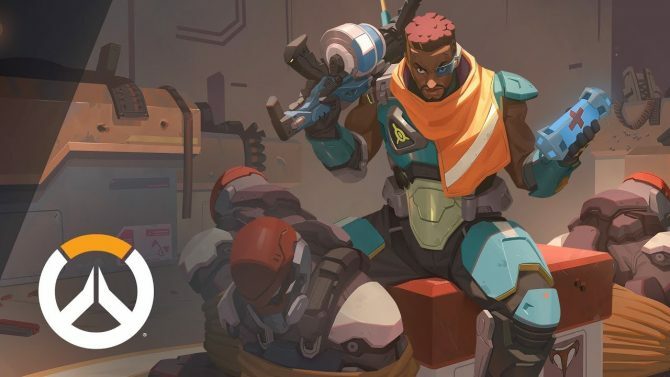 This simple and nearly forgotten mechanic, that allows to move and fire in completely different directions, is the perfect base for a fluid, action oriented shooter that pits a single hero against impossible odds. The game has no pretense of complexity: there are no friendly targets, and everything that will come at you will want to kill you in the most gruesome possible way. You simply have to explore the enemy Kroozer and kill everything that moves. 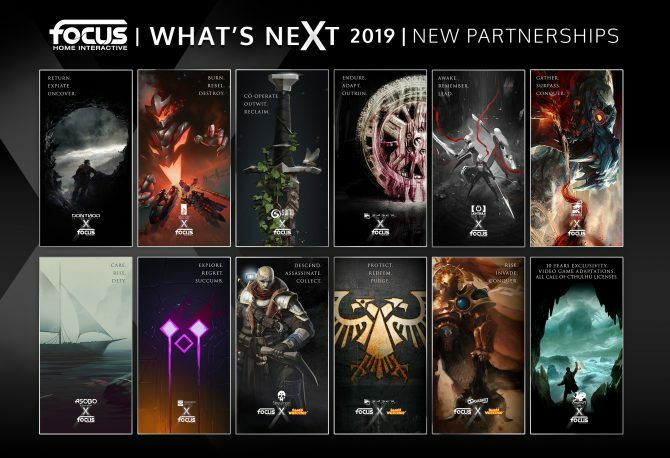 To do so, you will be prompted to chose between four classes with a different balance between ranged and melee combat. The Vanguard Veteran and the Librarian are close combat specialists, while the Techmarine and the Sternguard Veteran deal in ranged annihilation as their daily trade. 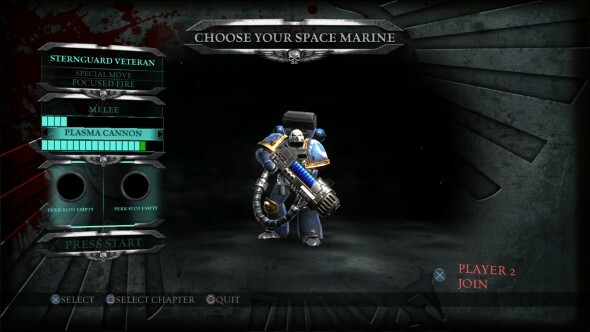 You can also chose between six different chapters (Ultramarines, Blood Angels, Blood Raven, Imperial Fists, White Scars and Salamanders), with the sole effect of changing the color of your Power Armor, but Warhammer 40,000 enthusiasts (like me) will squeal with glee at the opportunity. The campaign is split in five missions, from the moment you board the ship to the final confrontation with the Ork Warboss, and the ability to change class freely between missions helps in keeping things fresh. 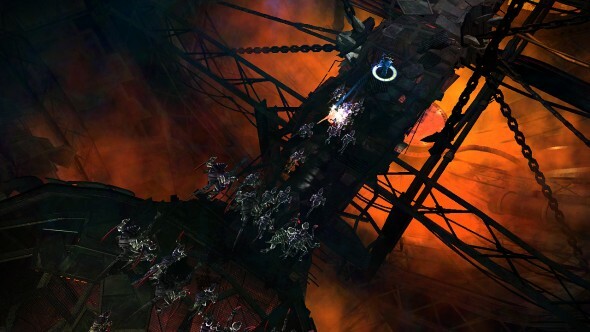 As you navigate through the complex (and quite colorful) halls of the Ork ship you’ll be attacked by large waves of enemies that will quite often risk to overwhelm you. True to the arcade shooter tradition the level of difficulty is quite high. At the end of each level a boss fight will challenge your skills even further. The final confrontation, made of several stages that will see you and the final boss fight basically all over the level, is probably one of the most satisfying and challenging I faced in my last few years as a gamer. 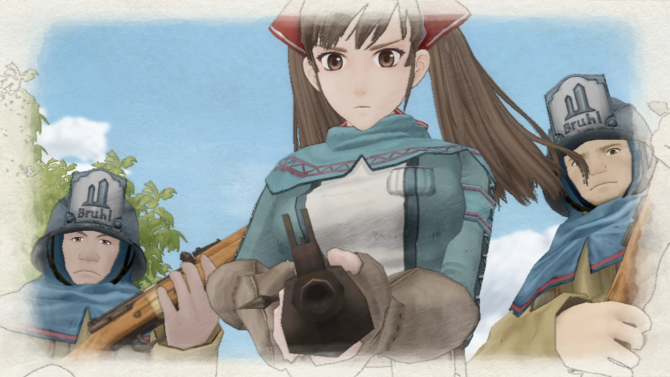 Luckily for the less patient of us, though, difficulty is still scalable, and death just means going back to the last checkpoint, which can still be a little frustrating, as the cutscenes that preface many of the checkpoints cannot be skipped, forcing you to see them several times if you continue to die in the same spot. 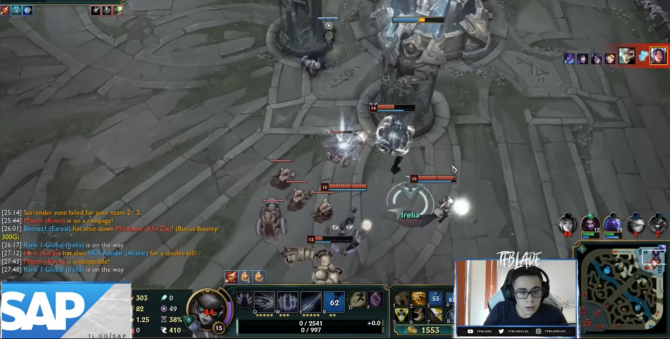 Speaking about cutscenes, the most gruesome between your kills will be replayed in slow motion, thing that can cause some annoyance, considering that the effect triggers quite often even during simple ranged kills that aren’t spectacular enough to warrant it, unnecessarily slowing down the action . While progressing through the levels, eight advanced weapons (two for each class) will be unlocked, together with a set of perks that will allow you to personalize your Space Marine further, adding a degree of progression to the massacre. In addition to this, several different timed power-ups are available, going from life regeneration to the traditional flavor of quad-fire. The wide variety of enemies that you will face contributes to obliterating any hint of boredom, ranging from basic melee-oriented Ork Boyz with a Choppa (the Orkish version of a cleaver), to ranged threats armed with missile launchers and flamethrowers, requiring very different approaches to survive different encounters. One of the elements that really shines in Kill Team is the level design. Each level is very dense in decoration and rich in detail, but even more than that, features different challenges and dynamic elements like transporters, exploding and destroyable areas, sabotage missions and even some limited platforming. Facing the endless waves of enemies with a friend is even more enjoyable, especially when choosing two classes that complement each other well. This, though, brings us to what’s probably the worst flaw of the game, the lack of any online multiplayer. Considering how exhilarating and fun local multiplayer is, the lack of online is definitely a missed opportunity to turn Kill Team into a real classic. On the side of the main campaign a pretty straightforward survival mode is also available, giving each player a single life and confronting him with wave after wave of enemies, timing how long they can hold on before being slaughtered. The mode is definitely satisfying, especially with a friend on your side, but even here the lack of online multiplayer can be easily felt. 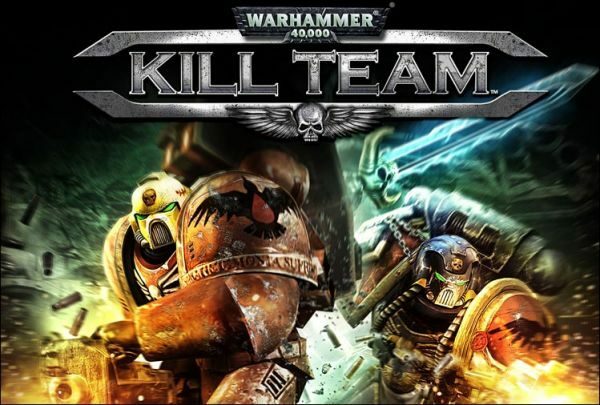 The visuals of Kill Team are definitely impressive for a downloadable game, taking advantage of the Engine of Dawn of War 2, and also sharing many of it’s assets (models, animations, textures and effects), they definitely demonstrate that an engine created for the larger scale of a RTS can definitely be flexible enough to bring the view point more close and personal. Overally, art direction is the true strong point of the game’s graphics. The colorful and complex design of the environments is perfectly appropriate to the salvaging-based culture of the Orks, enriched even further by many animated elements and a top-notch dynamic lighting engine that creates a great atmosphere that will definitely delight any Warhammer 40,000 fan. 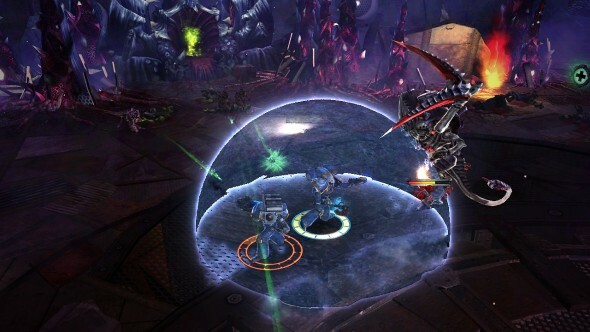 The audio aspect of the game is also well over the usual quality of a downloadable game, even if, like the graphics, takes a lot from the assets of Dawn of War 2. 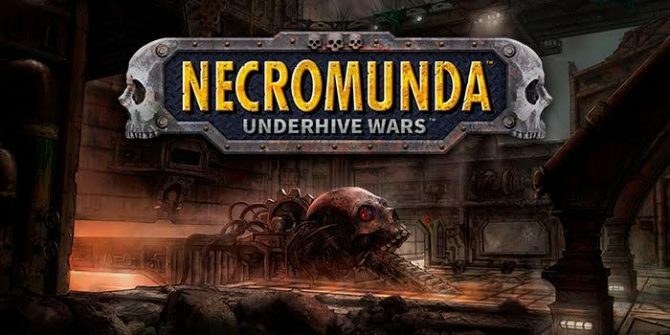 The soundtrack is epic, immersive and atmospheric, showing that THQ has by now acquired a perfect command of the Warhammer 40,000 IP, and the single voice actor that narrates the game and guides the player through the levels does a great job. While some will find his voice cold and detached, it has a strong, virile edge, and that’s exactly what a Space Marine is supposed to be. Veteran Space Marines are hundreds of years old, and have been trained and genetically engineered to be the very embodiment of cold and emotionless killing. All in all, the game is definitely a lot of pure, unadulterated action fun, that will appease both older games reminiscing many arcade classics and younger ones looking to shoot and disembowel everything in sight. Too bad for the lack of online multiplayer, that would have contributed to creating an instant classic, and for the lack of a PC version (which is quite strange, considering that the game is built on an engine originally created for a PC game), causing those that will buy the upcoming Space Marine on PC to miss on the bonus Power Sword granted by completing the first mission of Kill Team. Warhammer 40,000: Kill Team is ultimately a marketing ploy, designed mostly by re-using the engine of Dawn of War 2, and also recycling many of it’s assets in order to let console gamers get acquainted with the Warhammer 40,000 universe and to create hype for the upcoming release of Space Marine. That said, it’s one of the most enjoyable and satisfying marketing ploys I’ve ever seen, and it’s definitely worth the (small) price. 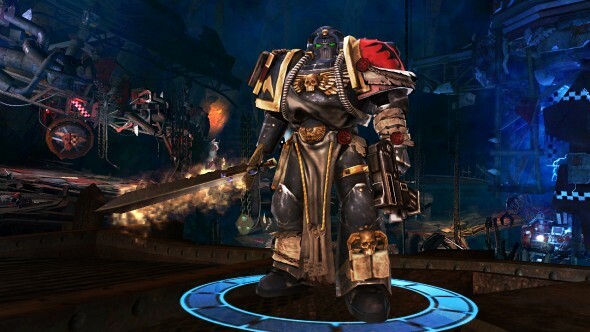 If this game won’t make you excited for the release of Warhammer 40,000: Space Marine, nothing will.